Located just off famed International Drive the Enclave Suites offers the perfect backdrop for family vacations in the heart of America favorite playground. As one of the only hotels on I-Drive to have an indoor swimming pool and outdoor balconies this family-friendly resort blends a fun-filled atmosphere with unparalleled amenities. 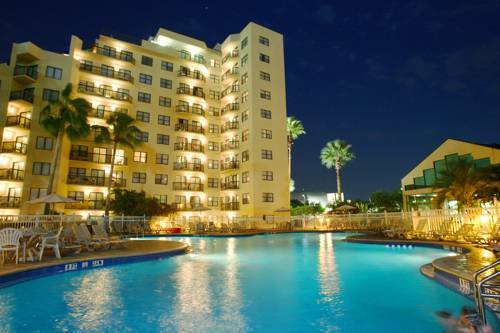 Features include deluxe studios and two-bedroom suites two oversized outdoor pools 2 kiddie pools Hot Tub the only indoor pool on I-Drive flood lit tennis court as well as stay Sky Kids Activities Club seasonal. All reservations require a deposit of USD 75.00 USD charged at time of booking. All reservations except Advance Purchase. Reservations must be cancelled by 6pm- 72 hours 3 days prior to arrival date to avoid forfeiture of deposit. Except Advance Purchase. Exceptions may apply - please see rate rules. Advance Purchase Rate plan Only -Advance Purchase reservations are non-cancellable and non-refundable. Shopping Dining and Entertainment Complex. Universal Stuidos and Islands of Adventure Parks tickets sold in lobby. Walt Disney World Resort tickets sold in lobby.